Portable FastStone Photo Resizer Portable is an image converter and resizer intended to enable users to convert, rename, resize, crop, rotate, change color depth, add text and watermarks to images in a quick and easy batch mode. Drag and Drop mouse operation is well supported. Photo Resizer Portable is fully portable, so you should be sure to extract the zipped download to a memorable location like the desktop. The program's extracted folder has everything it needs, so to move it to your thumb drive or another device, simply drag, copy, or cut and paste the entire folder, insert the drive into any compatible PC, and it will run normally when you click it. 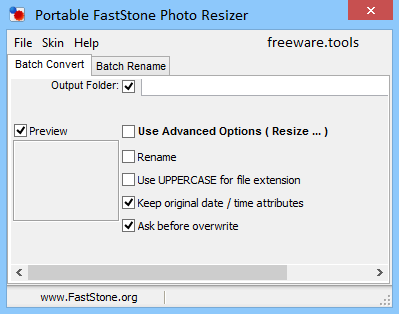 This is the portable version of FastStone Photo Resizer, a tool that lets you modify image files when it comes to their size, extension, name, and others. Since installation is not necessary, you can simply place Portable FastStone Photo Resizer on an external device, so you can run it on any computer. Plus, your registry items remain intact. Once you initialize the application, you will be greeted by a simple and intuitive interface in which you can use the Explorer-based layout or "drag and drop" function to add files into the input list. So, you can select their output format (e.g. JPEG, BMP, GIF, PDF), set rename filters in the "Batch Rename" tab, as well as enable Portable FastStone Photo Resizer to keep their original date and time attributes. If you access "Advanced Options" you will be able to configure settings when it comes to resizing, rotation, crop, canvas, color depth, effects (e.g. grayscale, negative, sepia, contrast, gamma) and DPI. But you can also add text, watermarks and borders. Plus, you can save options to file and load them later, reset their values to default, enable Portable FastStone Photo Resizer to ask before overwriting files with the same name, change the interface skin, and more. The application needs a low-to-moderate amount of system resources, includes a brief help file for newbies and quickly finishes a task without causing any problems. It's strongly recommend Portable FastStone Photo Resizer to all types of users. Freeware.Tools proudly serving over 10,000 subscribers. Get updates to your inbox.